The Team Harden (AZ) point guard ran the show for his team yesterday. DuSell showed excellent range but did much more than just shoot the basketball. DuSell was great at getting into the lane to create for himself and his teammates. With his scoring ability, feel for the game and much more, he could break out this season on the Gauntlet. He only holds three offers right now, but I’d expect that list to grow in the near future. Country of Georgia native Saba Giglberia was a pleasant surprise in yesterday’s games. The Team Uneek big man showed some amazing flashes as the game progressed. With him standing 6’10”, he is a matchup nightmare with how he is capable of playing out on the perimeter. Giglberia even showed the ability to break down his opponents off the bounce. He will definitely gain more attention this season on the Gauntlet circuit. Compton Magic point guard Yassine Gharram put together an impressive 15 point performance yesterday in a 68-51 win over EBO. Gharram was very crafty and showed a real sense for picking his spots. He converted both on the fast break and in the half court, which put the Magic in a spot to pull away. This high academic prospect is one to watch this season. Dalen Terry started his season off on the right note with a solid 10 point performance. He brought a great deal of intensity on both ends and proved why he is so highly regarded. Terry is excellent off the bounce and got the basket at will in certain points of the game. He is one of the main playmakers for this stacked Compton Magic squad and one they rely on to produce on the offensive end. Class of 2020 big man Jason Harris came to play in last night’s action. 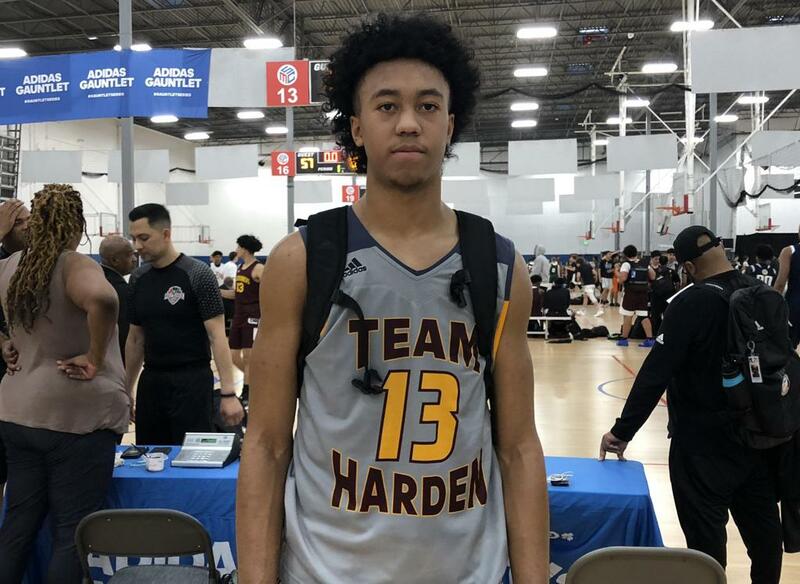 Harris had a tough matchup with a team as talented as the Compton Magic, but he showed why he is more than capable of competing at that level of play. Harris utilized his elite athleticism and built frame around the basket, which led to him scoring 16 points. Harris has an excellent motor and will be a pivotal piece to this EBO team.